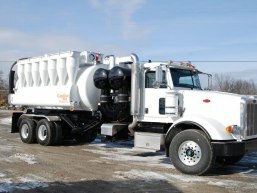 Liquid vacuum trucks (“Liqui-Vacs”) are used to collect and transport liquid and semi-liquid waste from construction and chemical or municipal cleanup operations. Liquid or sludge is drawn into the onboard storage tank (70 bbl) using rotary vanes capable of vacuums of 27″ Hg. Every truck includes hose trays. 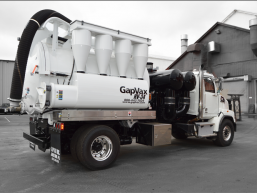 ERS’ liquid vacuum trucks have full-diameter waste doors with hydraulic lifts for easy removal of sludge and solids. These trucks can transport non-hazardous materials (usually sewage, septic or other natural waste) or materials classified as hazardous (such as process chemicals or petroleum products).